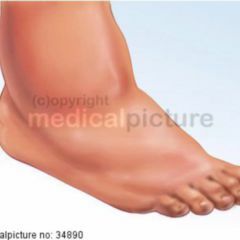 The foot refers to the distal end of the lower limb, a movable unit in primates consisting of bone and muscle, which enables running and possibly grasping and touching. The foot is made up of a bony skeleton and its associated muscles, ligament and tendon apparatus, blood supply and innervation. Anatomically speaking the foot can be rougly divided into the tarsus (tarsus), the adjoining metatarsal area (metatarsus) with sole (planta pedis) and instep (dorsum pedis) and the toes forming their end (digiti pedis). 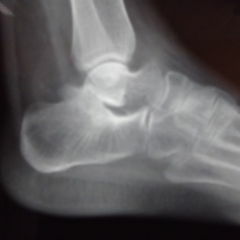 The heel forms the posterior portion of the foot. Clinically, the foot is divided into three sections, the forefoot, the metatarsal and hindfoot. The lower leg is connected to the foot via the ankle (articulatio talocruralis). The bones of the foot connected to one another via the joints are moved via the muscles of the lower legs, and by the short foot muscles. In the short foot muscles, a distinction is made topographically between the muscles of the rear foot, the sole, as well as the big toe pads and the little toe pads. The foot skeleton is tensioned by the tendons, ligaments and muscles accreted to it such that the bones do not lie flat on the floor, but form a dome that arch of the foot. Through the arch the body weight is not supported by the entire foot, but mainly by the heel (tuber calcanei), the large toe pads (large toe joint or I. metatarsal head) and the small toe pads (small toe joint or V. metatarsal head). The sensitive innervation of joints, skin, tendons and ligaments as well as the motor innervation of the muscles occur via the nervus tibialis, the nervus fibularis superficialis and nervus fibularis profundus. 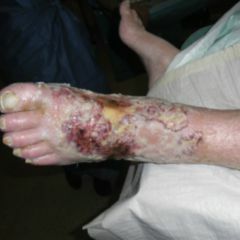 The arteria plantaris lateralis and the arteria plantaris profunda form the deep arch (arcus plantaris profundus in the front third of the sole of the foot. A superficial plantar arch can irregularly be found (arcus plantaris superficialis). The heel of the foot is supplied by the calcaneal branch of the peroneal artery arteria fibularis . The dermatome L5 projects itself on the digitus pedis I (hallux) and the digitus pedis II. The dermatome S1 projects itself on the remaining three toes and on the heel.